Winston and Sophie live in a big city. When they see a sign for chickens that need a home, Mommy says they don’t need to live in the country to raise chickens. And what could be better—pets that lay eggs! So they prepare the coop, tell their friends, and soon enough, the chickens arrive. But it seems that no matter what the children try, these chickens don’t want to be pets, and they refuse to lay eggs. Can anything change their minds? Will the chickens ever feel at home? 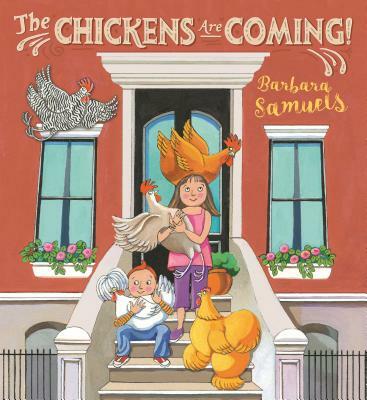 With bright, funny illustrations and an informative note from author Barbara Samuels, The Chickens are Coming! is a story about doing something new, learning to be patient, and welcoming new members into the family. When I was little I loved to watch my two older sisters draw. I remember a playground scene my sister Susie drew -- two girls playing hopscotch, every detail perfectly rendered, down to the loser’s tears. She also liked to draw ladies in stylish suits, complete with hats, gloves, and matching handbags (it was the 1950s after all). My other sister, Freya, specialized in queens and princesses. She could make the trimming on their gowns look like real lace. While their drawings seemed to appear magically on the page, for me it was a struggle. The hardest part was getting the right expressions on the faces. Sometimes I had to erase and redraw the mouth so many times it left a hole with a gray smudge around it. It wasn’t just my sisters’ drawings that seemed better than mine. All their things -- silk scarves folded in neat squares, crayons lined up in rows, with their waxy tips still pointy, jewelry locked in leather cases -- had the allure of the forbidden. Susie kept her best doll in its original box high up in her closet, and I was under strict orders never to brush her hair. Not that I could blame her, since my own dolls were strewn about my room -- usually recovering from multiple surgeries, missing their socks and most of their hair. And if you looked under the bed, you could find a few stubby crayons. It should be no surprise that Dolores, the younger sister in my books, always seems to triumph. I’ve been writing about her for so long that she now feels like a real person. Sometimes she even tells me what to write about -- she can be quite bossy. Duncan, her long-suffering cat, would certainly agree. In the house on Long Island where I grew up, we always had one or two cats. Trying to capture the many moods of my cats was probably how I finally learned to draw. I remember choosing the topic “How to Draw a Cat” for a seventh-grade speech class. By that time I could draw well enough to impress other kids, but I didn’t think about becoming an illustrator until much later. I had already majored in history at the University of Wisconsin, received my M. A. at the Teacher’s College of Columbia University, and taught for a few years, when I decided to go to the School of Visual Arts in Manhattan to study illustration. After I finished art school, I painted watercolor backgrounds for an animated film version of the Raggedy Anne Stories and worked on commercials for the cartoonist R. O. Blechman at his studio, The Ink Tank. I also did freelance illustration jobs for The New York Times, Seventeen, Cosmopolitan, and other magazines. Around that time, I became interested in doing picture books. A story about two sisters and their cat seemed a natural choice for me. I love the way the pictures in a children’s book can tell you what the words don’t. Some of my favorite illustrators are masters at this: Helen Oxenbury (Out-and-About books), Robert McCloskey (Blueberries for Sal) and Hilary Knight (the Eloise books). My editor, Melanie Kroupa, always makes sure that my characters’ expressions show what they’re really feeling, even when they’re saying and doing the opposite. It’s funnier and more true to life that way. Sometimes I have to revise the drawings many times, and it can get frustrating. But, thinking back to my earliest scribbles, I’ve always done it that way. I live in Manhattan with my husband, Nicholas, a psychotherapist, and my teenage son, Noah. We have two cats, Harold, an outgoing Siamese, and Claude, a shy orange tabby. Harold is very happy I’ve included him in a Dolores book. Claude, like Duncan, prefers to be left alone.